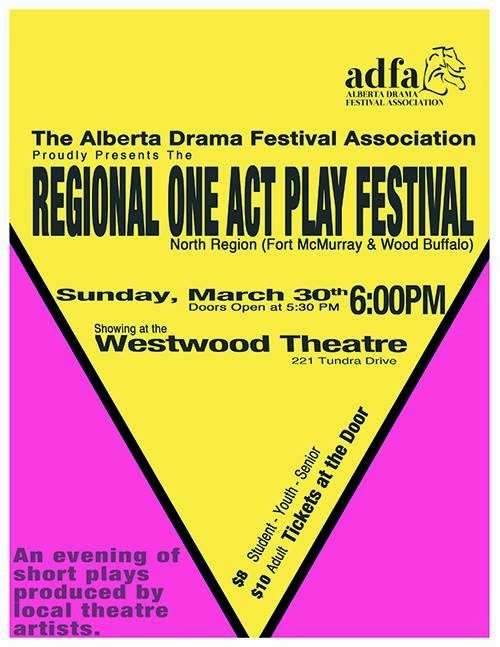 "What a wonderful night of theatre in Fort McMurray," said adjudicator Douglas MacArthur, who traveled to our northern community, all the way from Lethbridge, to offer his insights and expertise on the plays being presented at the Regional One Act Play Festival. I completely agree with his assessment. I was delighted with both the content and quality of the productions, and the robust number of people who came out to support live theatre. First up was re: all, a new original work by Fort McMurray's Zachary Barrett. 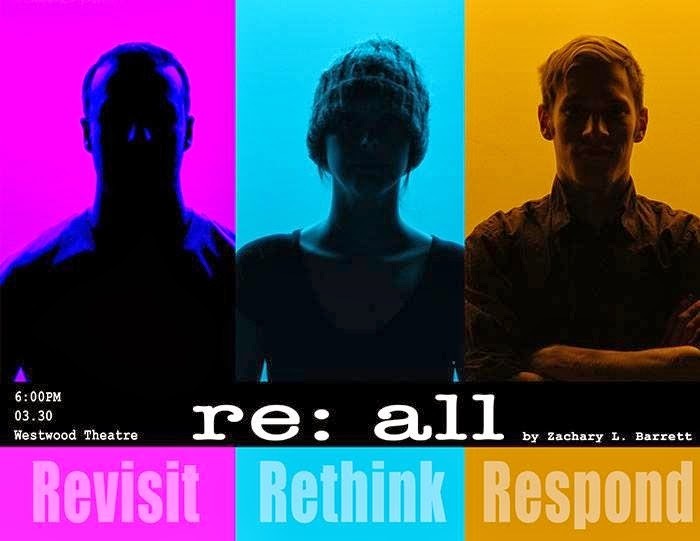 Featuring Jason Barrett, Johnny Muise and Amanda Campbell, this piece played with the nature of relationships in this technological age of gaming systems and texting. As a parent, I found it illuminating, a brief window into the world that my older son lives in and some of the communication and relational challenges he is likely to encounter as he marches, eyes front, into his adult years. I thought it appropriate that Mr. MacArthur singled out Johnny Muise for an honourable mention in the Best Actor category. In his first theatrical adventure, Johnny delivered an authentic and engaging portrayal of Tyler, the gamer next door, complete with the carefree attitude and zest for life that gamers often imbue. Amanda was spot on, as she always is, from that very first moment I saw her in Waiting for the Parade at interPLAY all those years ago - I've lost track of how many. She played Joey, the deceptively androgynous gal (guy?) neighbour on the other side of the wall. As the only female, she won the Best Actress award by default, but she earned every piece of it. Jason Barrett, who I have seen a number of times on film, was the central character, recovering from a recent breakup and trying to cope with having to define his existence without having a girlfriend as part of the picture. He was very believable and understated. I agree with the thought that this piece could translate exceptionally well to film. I enjoyed re: all a lot, and would love to see them integrate some of the suggestions made by the adjudicator and put this piece in front of an audience again. It deserves a life longer than a one performance run as part of a one acts festival. Going into Louis and Dave, directed by Michelle Thorne, I knew I was going to enjoy seeing Zenon Campbell again. The last two Keyano Theatre Company shows that he has been in have shown me what a well of talent he brings to the stage. What I didn't know was how he and Dave Boutilier were going to play off one another. Shock and awe are perfect words to describe my level of excitement over what I experienced. 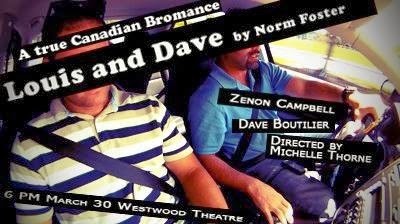 Written by Canada's most produced playwright Norm Foster - who will be in Fort McMurray this fall to open Keyano Theatre Company's 2014-2015 season performing in one of his newest plays - Louis and Dave is a show about two friends who drive around on Saturday night as their primary means of entertainment. In my hometown we called this activity going "Up and Down the Boulevard". And as hyperbolic and large as they played it, I have fond and vivid memories of the fun and anticipation of driving around looking for girls. And while the song choice might have been different - Louis and Dave were singing along to "Total Eclipse of the Heart" - we spent hours driving slowly through Kamsack, feeling all grown up, telling tales and talking about girls (not much else). Zenon was awarded Best Actor for his work as Louis. He is just so strong and fun to watch. I'm convinced he could do this full-time as a professional if he ever decided to make a bank account draining career switch. Dave Boutilier, on the other hand, was the surprise of the night for me. I kept thinking of comic genius Dom DeLuise watching Dave as Dave. The only difference was that I always saw DeLuise as a spoof, a goof; I saw Dave as an authentic human being. I felt his portrayal was as honest and compelling as I have ever seen. He also seemed strangely familiar, like I actually drove around with the guy back in the days of acid wash jeans, big hair and rockin' 80's hits. Louis and Dave will represent the North Zone at the Alberta Drama Festival Association's Provincial One Acts Festival in Grande Prairie in May. They will do us proud, of that I have no doubt.